In The Woods is scattered amongst the magical forest are hidden stages, beautiful lights and captivating art installations. 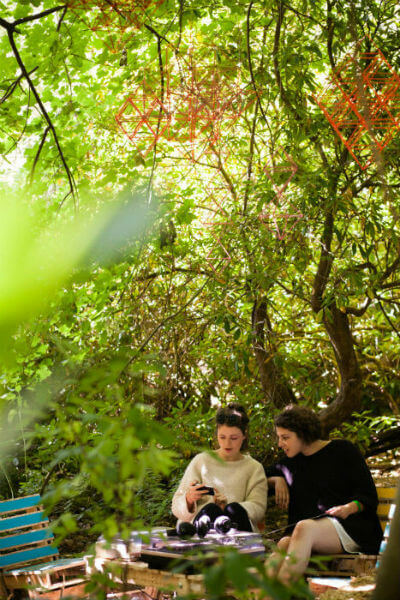 Festival goers are free to mingle with nature while listening to music from up and coming and exciting bands. With a silent disco and gigantic bonfire to finish things off it really is one of the years unmissable parties! 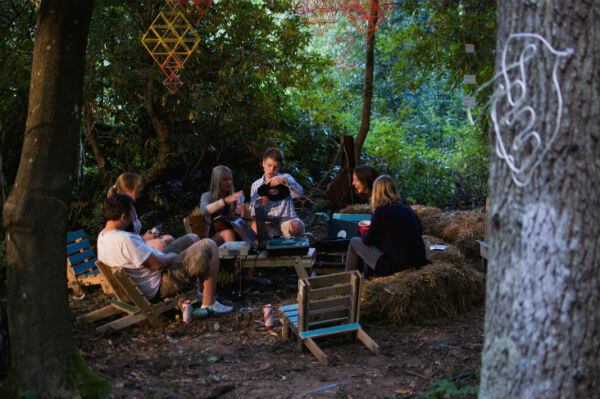 We were lucky enough to provide some furniture for the 2013 In The Woods Festival as part of their chill out music and theatre zone. Here there were records to listen to, hay bales to relax on and art and theatre to enjoy. 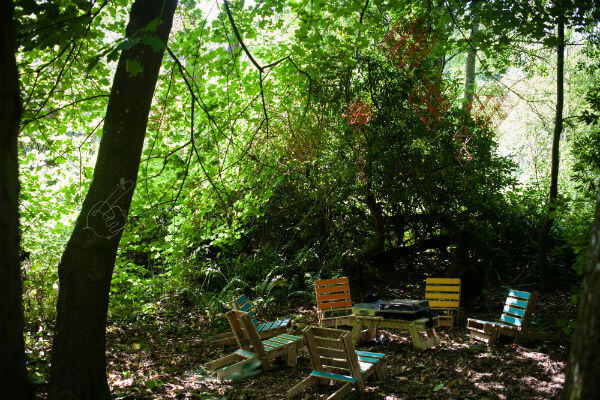 With a backdrop of trees and beautiful summer colours this was a perfect setting for our pallet furniture (or festival furniture as we now like to call them). 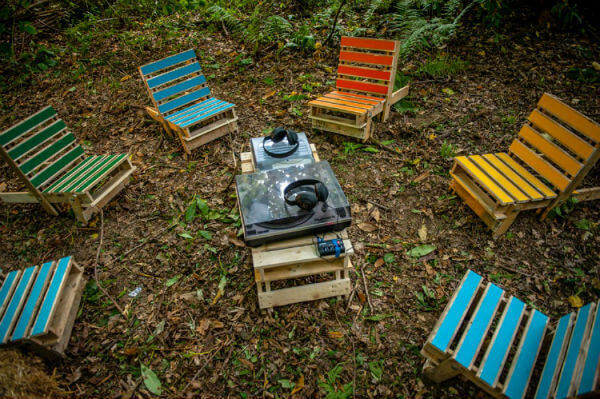 Festival designer Anna Mojab was able to have the furniture in any colours she wanted and was able to match them with the other colorful installation set amongst the forest. To see more photos from the festival please visit their site… In The Woods Festival. 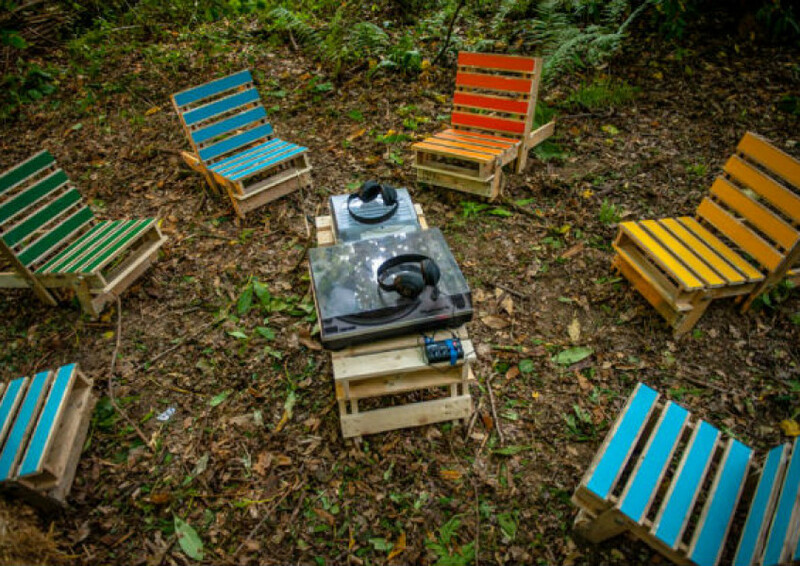 The Pallet Chair & Table are extremely robust and light, making them perfect as festival furniture. As each piece can be folded flat they are easily stacked and transported in a car or small van. They are compact, small and easily carried making them perfect as bar furniture and seating areas. They are low to the ground and comfortable which means the can easily be used around a campfire or camping seating area. For more information or to inquire about any bespoke requirements please get in touch: info@gasandairstudios.co.uk.